In this series, guest columnists respond to one of three topics selected by ELGL co-founder Kent Wyatt. This week Rafael Baptista, City of Raleigh, NC, writes about a recent job transition. Back in October of 2017, I left my position as the Strategic Initiatives Analyst for the Durham County Manager’s Office to become the Strategic Planning and Performance Analyst for the City of Raleigh. In this post, I will discuss how I decided it was the right time to make a move and what I hoped to accomplish in my first 60 days in Raleigh. Regarding knowing it was time to pursue a new position, it was not an easy decision. Durham County was my first employer after graduate school. During my three years there, I had some truly incredible experiences and got to work alongside some amazing individuals both within the organization and the community. Some highlights include designing and running an award-winning Design Thinking Project to help minimize staff turnover at the EMS department, helping completely refresh the County’s Strategic Plan, working closely with partners in the criminal justice system, spending ten months as a joint employee with the City focused on city-county collaboration, getting to co-present at a national conference on the City-County IdeaLab, and working to set up a temporary homeless day center with partner agencies. I worked work alongside many amazing people and really grew into my professional self. Despite all those positives, I also knew that to meet my career goal of becoming a City/County Manager, I needed to add additional skills in performance management and budgeting into my professional toolbox. When I saw the Raleigh job opening, there was no doubt in my mind that this was a great opportunity. I knew that I would have the opportunity to join a great team and the ability to really focus on improving my strategic planning, performance management, and budgeting skill sets. I have been with the City of Raleigh for about nine months. 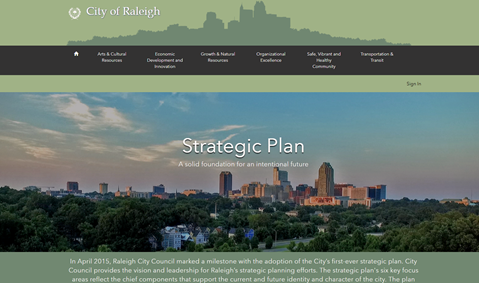 I have enjoyed working on the Strategic Plan which guides much of the work that the City does. I also leading the City’s Strategic Planning and Performance Analytics Academy. When I started the position, my goals for the first 60 days really were to gain a strong understanding of my new roles, understand the culture that I was joining and to be a value add.